Are you looking to achieve PRINCE2 Certification and become a certified professional with PRINCE2 Foundation or PRINCE2 Practitioner title? We have good news for you; we have a solution, which can help you clear the PRINCE2 certification. We are here to assist you in achieving your goal by using our online certification practice exam platform. With tons of experience in the field of Project Management and Quality Improvement, our expert panel has designed these practice exams the same as real PRINCE2 certification exams. 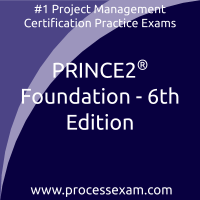 Our team of experts recommends you to use these online PRINCE2 certification practice exams for your PRINCE2 Foundation or PRINCE2 Practitioner Certification preparation. These practice exams will help you to validate your knowledge and identify the areas which need improvement, will make you familiar with PRINCE2 certification exam environment, exam pattern and question format. I am grateful to the PRINCE2 Practitioner mock tests and processexam.com for giving me many features. I was this average professional but i decided to give PRINCE2 Foundation certification exam. I gave the demo test on processexam.com site and it helped me much in deciding whether i should opt for the PRINCE2 Foundation mock tests or not. I became a premium member because i got so many benefits with it like awesome features which helped me compare my performance with my past attempts and rise ahead. I could give a single mock test as many times as i wished to. This feature of unlimited attempts made me become a master in the topics of the PRINCE2 Practitioner certification exam. Scoring 90% was not tough at all i must say in the actual exam. There are no loopholes in payment gateway for the PRINCE2 Foundation mock tests. I got access and i gave PRINCE2 Foundation actual exam without any burden on my head. PRINCE2 Practitioner question bank practice on a daily basis inculcated the sense of time in my schedule and life. I learned how to manage time and how to complete the mock test as early and as correctly as possible. 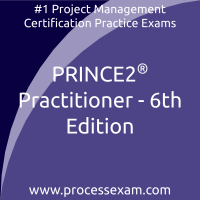 PRINCE2 Practitioner certificate exam i passed and scored well and moving on in my professional career now.